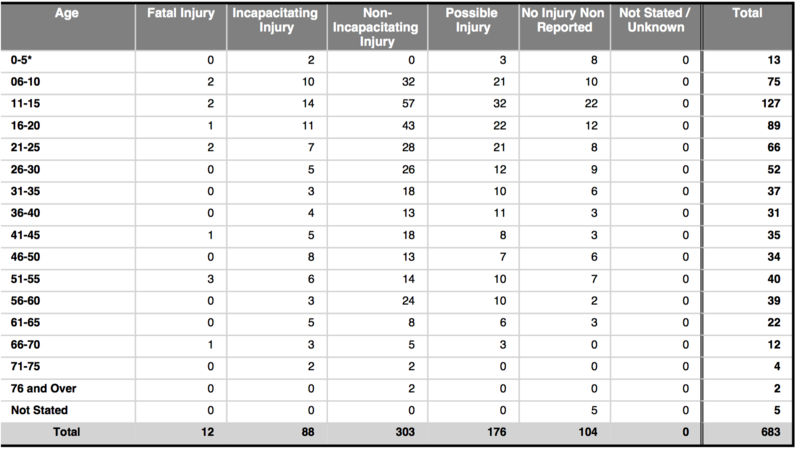 As of this writing, August 23, 2015,there have been 683 bike crashes listed in the ODPS data base. In those crashes there have been 12 reported fatal crashes, 88 crashes involving “incapacitating injuries” and 303 non-capacitating injuries. The fatal crashes have included 2 kids 10 and under, 2 kids aged 11-15 and 3 more under the age of 25. That’s a bit unusual. In the past several years, the vast majority of riders killed on Ohio roads have been older. Half of the fatalities occurred in daylight, 4 were on dark, unlit roads and 2 were on dark, lit roads. This is fairly common. The percentage of nighttime fatal crashes far exceeds the percentage of nighttime cycling miles. As many readers know, I have an ongoing project in which I try to look closely at EVERY fatal bicycle crash in Ohio. I try to search these out in “real time” by reviewing media reports through Google alerts and following up on reports sent to me by alert readers. From my Bike Lawyer Facebook page I post regular updates on the crashes. I do my own analysis of what happened who, in my view, was at fault. I try to step back and look at the big picture – does the particular crash fit into any pattern or theme? Are there any lessons for cyclists, or cycling advocates, which we can take away from a crash. Brenda Hoffman was a very active woman. On April 23, 2015 she and a friend, Bradley Hollingsworth, were riding along right side of State Route 60. They were on a training ride, apparently, and were actually riding OFF the road, to the right of the white line. 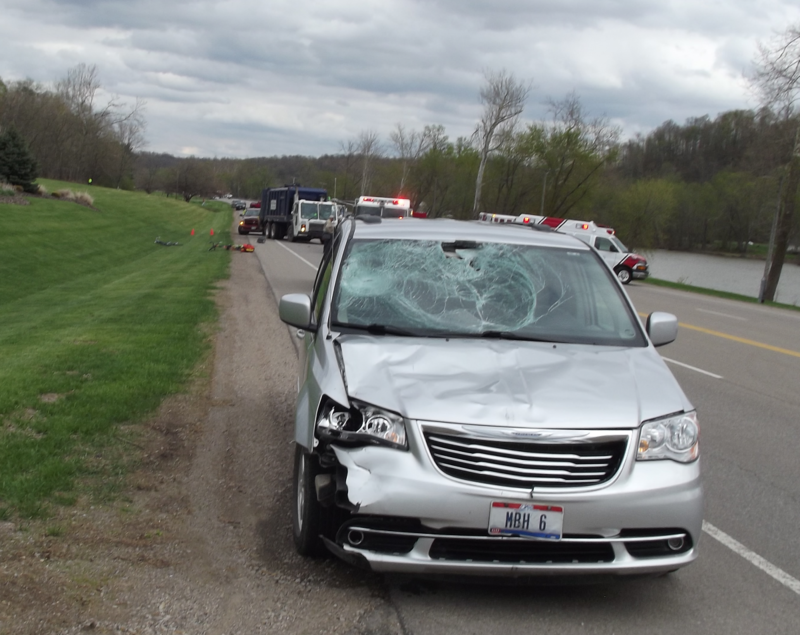 The crash occurred around 5:20pm on a clear, dry Thursday evening. OSHP notes that the weather was “mostly cloudy with 89% cloud cover, 48 degrees…” State Route 60 is a 4 lane 55 mph asphalt country road that meanders along next to the Muskingum River for a good spell. The road was dry. Marjeane B. Hammer, a 66 year old woman, came up from behind the two riders in a 2011 Chrysler Town and Country minivan. She went off the road and smashed into the two riders from behind, killing Brenda Hoffman and maiming Mr. Hollingsworth. How does that happen? It’s not dark – or foggy. It’s a nice morning. You are driving along a long straight stretch of road. Surely you would have seen them BEFORE you passed the truck? Some interesting points from the crash report. • OSHP indicates both cyclists were riding northbound off the roadway, to the right of the white line, along an almost 6 foot wide berm. • There were two 12′ northbound lanes and two 12′ southbound lanes. • Ms. Hammer was also driving northbound. 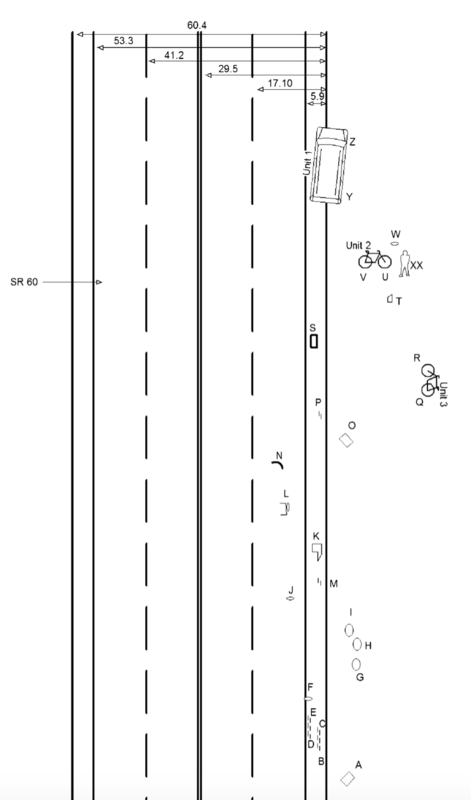 • The initial “skid” points for the bicycle were 2.9′ and 5.0′ to the right of the white lane line. I suspect an accident reconstructionist would conclude that these “skid” marks were left when the car struck the bikes and forced the bikes forward such that the rubber tires were scraping the pavement and leaving behind “skid” marks of burnt rubber. These point probably reflect the initial Point of Impact. • The front tire was 250′ away when the car stopped. The report notes that while alcohol tests were given to the motorist, alcohol was “not suspected” – so we’ll wait and see what the forensics show. My guess is they probably asked, she probably consented – but then got counsel who advised her to clam up. If there was a cell phone in the car, my guess would be that OSHP will want to do forensics on the phone as well. THE BIKELAWYER’S OHIO BIKE CRASH APP RELEASED!